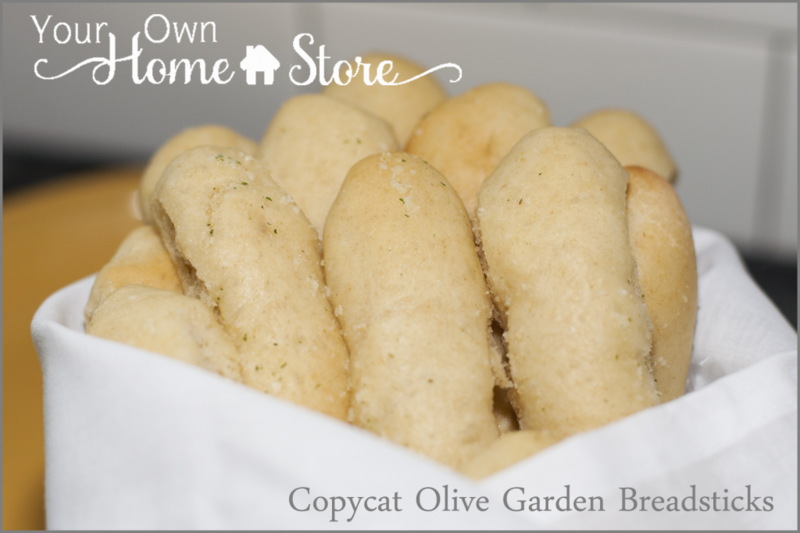 Breadsticks…especially Olive Garden’s garlicky, buttered breadsticks are a favorite in our house. One of my twin boys regularly asks to go to Olive Garden just so he can have the breadsticks (and a bowl of olives…ha). Plus, breadsticks pair so well with so many dishes such as Italian foods, chili, or soup. I’ve been buying some at the grocery store that we’ve been eating lately, but they just don’t cut it. I wanted something better…healthier, less processed, and more Olive Garden-like. So I went in search of some copycat recipes. I found these and these, but after reading the comments on both, I finally decided to convert Autumn’s Better than Olive Garden breadsticks recipe from It’s Always Autumn to 100% food storage. 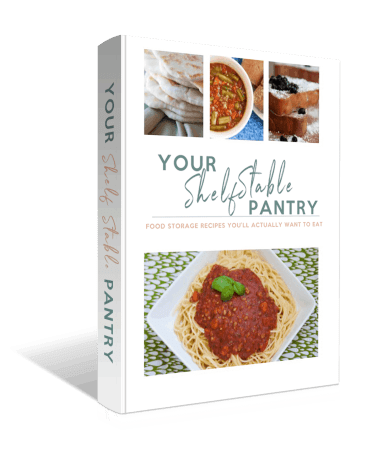 You can see (and print) the final recipe at the bottom of this post. Now, I must admit, the first time I made these, they turned out…let’s just say, not as amazing as I’d hoped. (But they were mouthwatering the third time). It was a smaller amount of dough than I’m used to putting in my mixer, and I added all the dry ingredients first. The mixer just pushed the dry ingredients around while all the wet stuff stayed on top. FAIL. I took it out and hand mixed/kneaded it, but in the process added a bit more flour, and the breadsticks turned out flat and heavy. 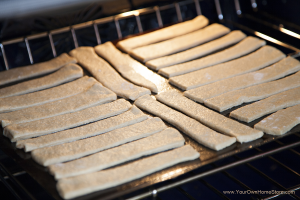 Plus, I forgot to grease the cookie sheet, and the breadsticks really stuck to it! Luckily, I had decided to make three batches so Angie (my photographer) could get pictures of each stage of the 2.5 hour process in the hour she was here. So, for take two I added the wet ingredients to the mixer first and things went much better. Only…then I forgot to let the breadsticks raise the second time and just put them straight in the oven. So, once again we had a FAIL. They weren’t as dense, but they were FLAT. Bummer. I still had take three, but those wouldn’t finish cooking until after dinner. So, Angie left. I fed my kids the spaghetti I’d made (see my homemade spaghetti sauce recipe) along with the breadsticks from take two. When my husband asked the kids if they thought the breadsticks tasted just like Olive Garden’s, one twin responded: “Uh, well not very much like them. Not at all really. But I’ll eat it anyway.” Sweet kid. Take three got out of the oven about 15 minutes after we’d finished eating. Since I hadn’t added too much flour, had let them rise appropriately, and remembered to grease the cookie sheet, they were much fluffier and looked a lot more like what I’d been hoping for. We all excitedly tried one…then two, and a few of us (I won’t say who) even had three. My kids LOVED them. They begged to have them again for lunch the next two days. They really did taste just like those from Olive Garden…so light and fluffy. So, after three tries, I got it right! Just make sure not to add too much flour and not to skip the second rise, and you will be good to go! And I had Angie over the next week, made the breadsticks again, and got some great pictures! Gather your ingredients. 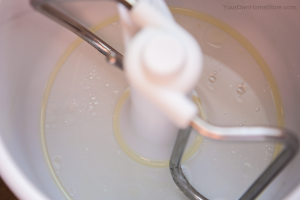 Mix the dry ingredients in a bowl, and put the water and oil in your mixer. Slowly add dry ingredients to the mixer on low (I had my set on 2) speed until well incorporated. Then, let it run for about five minutes until the dough pulls away from the sides of the mixer, but not the bottom. Add a bit more flour if needed to make this happen, but not so much that it pulls entirely away from the bottom into a complete ball. Dough will be sticky! Put a touch of olive oil on your hands and in the bottom of a medium bowl. 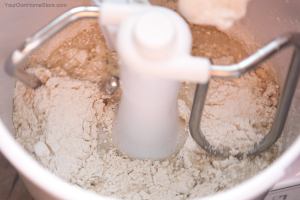 Remove dough from mixer. Roll into a ball and put in bowl. Cover with a wet kitchen towel, and let rise until double in size (1-1.5 hours). Once they’ve risen a 2nd time, put them in a 350° oven and bake for 12-16 minutes until golden brown on top. While baking, mix butter powder, olive oil, and garlic salt in small bowl. When breadsticks are done, quickly stir butter mixture (it will settle), and then immediately brush tops of breadsticks with butter mixture. 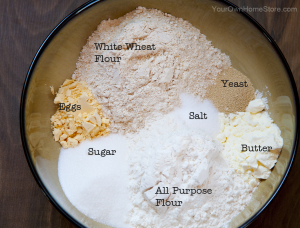 Mix the dry ingredients in a bowl, and put the water and oil in your mixer. Slowly add dry ingredients to the mixer on low (I had my set on 2) speed until all drying ingredient are incorporated. Let run for/knead dough for about 5 minutes. 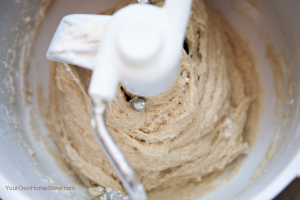 The dough should pull away from the sides of the mixer, but not the bottom. Add a bit more flour if needed to make this happen, but not so much that it pulls entirely away from the bottom into a complete ball. Dough will be sticky! Put a touch of olive oil on hands and in the bottom of a medium size bowl. 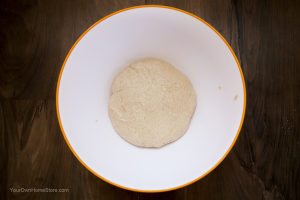 Remove dough from mixer, roll into a ball, and put in bowl. 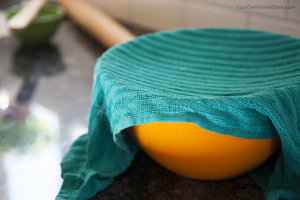 Cover with a wet kitchen towel, and let rise until double in size (1-1.5 hours). 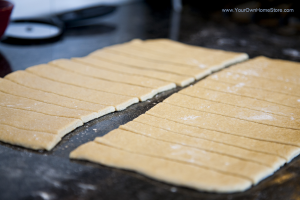 Once dough has risen, roll it into a 10 x 12 rectangle and use a pizza cutter to cut rectangle in half, and then each half into 11-12 slices/sticks. Move to greased cookie sheet, and let rise until double again (about 30-45 minutes). Once they've risen a 2nd time, put them oven and bake for 12-16 minutes until golden brown on top. While breadsticks are baking, mix butter powder, olive oil, and garlic salt in small bowl. We really like these also and I will sometimes add some of the Thrive Parsley into the butter mix. Also try sprinkling with Parmesan Cheese after the butter coating.